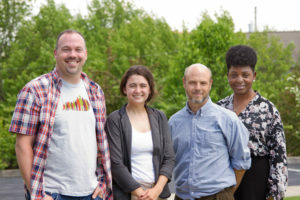 KFTC members Chris Woolery, Laura Greenfield, Josh Bills, and Cassia Herron come together to advocate for solar rights. Solar advocates’ latest victory comes from the Bluegrass State. This spring, an impressive coalition of solar supporters successfully defended net metering in Kentucky. They defeated a bill, HB 227, that would have effectively destroyed net metering, and with it Kentuckians’ right to go solar. The bill, introduced in January, would have reduced net metering compensation in Kentucky by 70 percent, by setting the rate at the utilities’ avoided cost, which is about $.03/kwh. Had it passed, it would have extended the payback period for a solar system to 20 years or longer. The bill would also have limited solar systems to 30 kilowatts. The original version of the bill did not even grandfather in existing solar customers. The legislative session ended with the bill being quietly shelved, despite several attempts to amend the bill to make it palatable to solar supporters. The bill’s failure this term – though it may possibly be reintroduced next session – was not from lack of trying by anti-solar forces. HB 227’s backers spent more than $200,000 on lobbying in January and February alone. This money came from big investor-owned utilities, the Kentucky Association of Rural Electric Cooperatives, the Kentucky Chamber of Commerce, the Kentucky Manufacturing Association, two groups sponsored by the Koch Brothers, as well as an ”astroturf” (false grassroots) organization called the Consumer Energy Alliance (CEA). A newspaper editorial cites this effort as approaching the all-time spending record for any Kentucky lobbying campaign. These organizations didn’t just provide financial muscle. They used underhanded tactics to influence legislators and the general public. One legislator who had at first intended to support the bill wound up voting “no,” because he discovered that phone messages he received from constituents in support of the bill were fraudulent. When the representative called these constituents back, he discovered they hadn’t made any such calls to him. Anti-solar forces also paid for deceptive robo-calls that urged listeners to phone their support for the bill as a way of helping the cause of solar power in Kentucky. While CEA brands itself as “the voice of the consumer”, in reality it is a front group that has taken millions of dollars from monopoly utilities and fossil fuel sources. The organization testified twice in favor of HB 227 during hearings on the value of solar energy. There is also conjecture that CEA may have been responsible for at least some of the fraudulent or misleading calls noted above. Leading the charge in defense of solar was grassroots organization Kentuckians for the Commonwealth (KFTC). While it could not compete with bill supporters’ dollars, it more than matched them in passion. KFTC built an extraordinary alliance that impressed legislators by its numbers, its breadth, its members’ command of the issue and, above all, by its tenacity. KFTC planted the seeds of success before the bill was introduced. It created and disseminated a “sign-on” letter to seek support for solar from legislators in 2017. The organization deliberately didn’t brand the letter as a KFTC initiative to get as many signatories as possible from business leaders, local officials, faith leaders, free enterprise champions, energy and environmental organizations, rural development organizations, housing advocates, and even Tea Party-affiliated groups. The letter was updated when HB 227 was actually filed, and was sent to all members of the General Assembly. By the end of the legislative session, it had more than 500 signatories. All the signatories were then sent updates on the letter to keep them engaged. “It was vital that legislators see the broad range of organizations and businesses that support net metering and independent rooftop solar businesses and that value distributed energy resources,” Wilkins said. Under pressure from all these constituencies, the bill’s champions tried to create an acceptable amended version. The final version of the bill had, according to Wilkins, three planks that solar supporters would not accept. It gave each utility, not the solar customer, the option of determining whether to give the customer kilowatt-hour credits or financial compensation for excess power fed back to the grid. Had utilities opted for the later, it could have created tax problems for customers. The bill also mandated that the Kentucky Public Service Commission (PSC) perform a valuation of solar. This would have been acceptable to solar advocates, except that the bill instructed that the PSC should only consider costs in its valuation, not both the costs and benefits of solar power. Lastly, solar advocates wanted a single administrative case to be brought to the PSC that would have involved all utilities and all other stakeholders. Instead, the legislation called for the PSC to address each utility’s case individually. Since there are 23 regulated utilities in Kentucky, it would have been an enormous financial burden on the state’s small solar businesses to be a party in all those cases. Such grassroots activism proved effective. Constituents also contacted their lawmakers directly through every means possible: calls, emails and direct lobbying. The voices of everyday Kentuckians – including people who are not yet solar customers – who spoke up loudly and repeatedly against this bill were as important as the small but growing solar industry itself. Some unlikely supporters in the legislature included lawmakers from rural eastern Kentucky, who dislike the state’s utilities for reasons unrelated to solar, those from progressive urban districts and even free-market Republicans who support energy choice. “Perhaps the key takeaway for KFTC, solar businesses, environmental groups, and other solar advocates was the value of collaborating on consistent, coordinated messaging. We were many voices singing the same hymn,” Wilkins said.